Good job on a fun class last night, everyone! Now is the time to start preparing for our tournament and grading. The tournament is coming up fast on November 23 and 24, 2018. The grading is scheduled for December 11, 2018. We will soon be asking for people to sign up to volunteer with various aspects of our tournament from helping in the canteen to working at a scoring/timing table. None of the jobs are difficult, so please jump in and help out! We encourage ALL of our students to participate in the clinic and tournament. It is a great weekend to learn and share your skills and experience with other karateka from many other clubs. Jacket orders will be due soon. An online order form is below, and we have paper forms at the dojo. Please be sure to pay as soon as possible if you order with the online form. If you turn in a paper order form, please include your payment. Jackets will not be ordered without payment. Be sure to keep practicing your techniques and kata at home so that you’re ready when the time comes. Our jacket order forms are now ready and we will have sizers at class this week. Here is an online order form if you wish to submit your order. Congratulations to everyone on a great class last night! 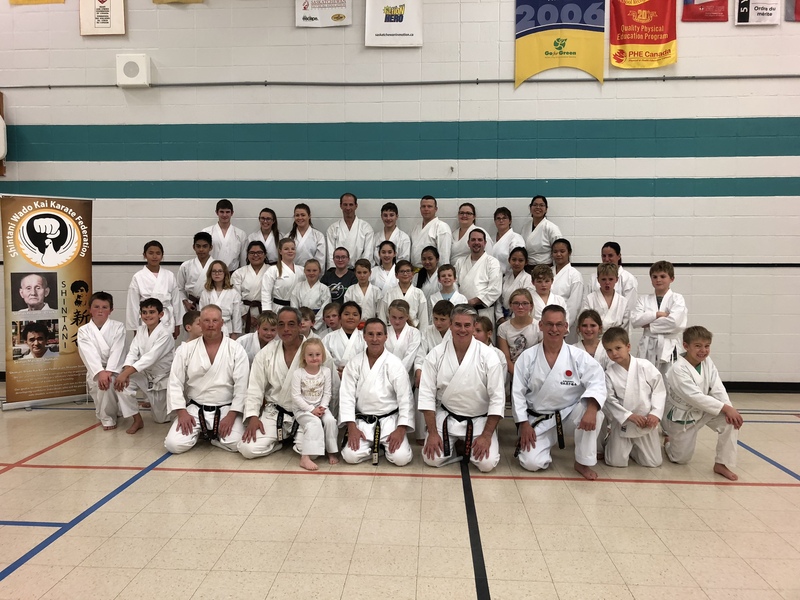 Sensei Ron and Sensei Sanford really enjoyed working with all of our students and were very impressed with the quality of your karate! Great job, everyone! Special thanks, again, to Sensei Ron, Sensei Sanford, and Sensei Brad for visiting our dojo. We hope they can come back again soon! If you were unable to hand in your hoodie/t-shirt order forms yesterday, we can still take them today if you are able to bring them to either of the schools in Carlyle. If you can’t get them to a school, please contact the club and we’ll see if we can make alternate arrangements. The order will be called in on Friday morning. Now we get to start preparing for our tournament and grading! Woo hoo! Hoodie Orders Due – Sensei Ron Visit TODAY! Just a reminder to everyone interested that the order forms for hoodies and t-shirts are due today with payment. We hope to have them before our home tournament at the end of November! Order forms are included below. Sensei Ron and Sensei Sanford are visiting our dojo today and will be leading portions of our workout! Sensei Ron is the head instructor for our Shintani Wado Kai Karate Federation and an 8th dan black belt. We are always excited when he can come to our dojo! Sensei Sanford is an exciting, high-ranking black belt in our organization who always brings new ideas to his workouts. Please make sure you are ready to go at the start time of your class. Great class last night everyone! It was nice to everyone working so hard! Remember that Sensei Ron and Sensei Sanford are joining us next week, so please be on time for your class. The order forms for the Hoodies and t-shirts is below if you wish to download and complete one. They can be returned to the dojo next week, or to either of the schools in Carlyle with payment. Please note, that this is a NEW order form which reflects the small price increase we discussed in class. We apologize for the confusion. Order forms are due in next week. Let’s gear up and look great at our tournament in November! Thank you to everyone who came out to help with another successful bottle drive! Also thank you to anyone who donated to the drive. The funds raised are used only to assist our members directly in their karate training and experience. Check out our latest addition to the Words of Wisdom page.